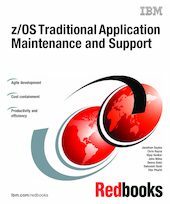 In this IBM® Redbooks® publication, we attempt to provide fresh insight into a problem domain that, in the authors’ opinions, has been pushed to the back burner of technology writing for far too long—the domain of z/OS® (traditional) mainframe maintenance and production support. Since the mid-1980’s, outside of a few websites and publications, this still-critical area of software has barely even received lip service by the world of mainstream technology media. In a small way, we are attempting address this situation. In this book, we provide information in “what and how to” sections on the value of z/OS maintenance and support—not the value of the software, which is hardly in question, but the value of the software developers, and how they collaborate, analyze, code, and test the applications, fixes, and enhancements under their responsibility. We present new 21st Century tools to help them achieve their goals more easily and effectively. These tools integrate and provide a 1 + 1 + 1 = 5 value-proposition, for companies that are still doing work the way they did when in the mid-1970’s, when Gerald Ford was president of the United States. We are also describing, to a lesser extent, how you can effectively integrate the new tools with your existing development software stack, in order to find points of complimentary functionality. And we describe the new agile development and maintenance methodologies, and best practices for tools use and adoption. We hope that you find this work useful, and perhaps that it can fuel more discussion, future Redbooks publications, and other publications by IBM, or any vendor or group interested in this critical and vastly under-acknowledged technology domain.